The following content is a brief and unofficial prerequisites guide to setup, configure and deploying the ServiceNow ITSM Adapter (Connector) version 1.0.8 for Citrix XenApp & XenDesktop Service prior to deploying in a PoC, Pilot or Production environment by the author of this entry. The views, opinions and concepts expressed are those by the author of this entry only and do not necessarily conform to industry descriptions or leading best practises. The views expressed here are my own and do not necessarily reflect the views of Citrix. The Citrix ITSM Adapter (Connector) is now available in the SN App Store – https://store.servicenow.com/sn_appstore_store.do#!/store/application/bb5ca9a2db9bd700677d3437b996190f/. So what does this actually mean for you and your organisation? 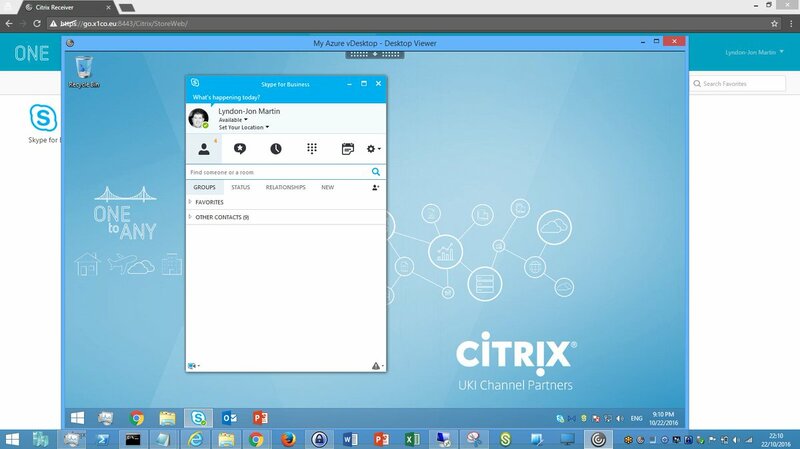 If you are a Citrix + ServiceNow customer the integration or rather release of the ITSM Connector allows for the automated provisioning of Citrix virtual apps & Citrix virtual desktops, including monitoring and management via the Citrix Cloud Connector. The offering includes defined roles and permissions for End-users (request new virtual apps, desktops or even reset there own sessions) vs. Administrators defined for Citrix (Consumer of ITSM, adds XAD and or Site Aggregation Service e.t.c ) vs. ServiceNow (Performs the integration). Suggested read the following announcements “Introducing Citrix Integration with ServiceNow” – https://www.citrix.com/blogs/2018/08/20/introducing-citrix-integration-with-servicenow/, “Citrix and ServiceNow Improve Workspace Automation and Employee Experience” – https://www.businesswire.com/news/home/20180820005155/en/Citrix-ServiceNow-Improve-Workspace-Automation-Employee-Experience. Finally relive/recap from Citrix Synergy 2018 surrounding the initial ServiceNow Integration announcement below. The diagram (page3*) above is from the Citrix + ServiceNow documentation which deceits the follow of communication and traffic. 1. I would strongly advise that you download, read the documentation below carefully in the following suggested order as well. 2.1. If you have not already sign-up to CC following the on boarding process carefully for new vs. existing customers – https://docs.citrix.com/en-us/citrix-cloud/overview/signing-up-for-citrix-cloud/signing-up-for-citrix-cloud.html. 2.2. Refer to the ServiceNow documentation for on-boarding of new vs. existing customers – https://docs.servicenow.com/category/london. 3. You’ll need to obtain a “Client ID” and “Secret” from Citrix Cloud e.g https://docs.citrix.com/en-us/xenapp-and-xendesktop/service/install-configure/cloud-connectors-install.html along with your AD user domain (You’ll know what that is). 4. Complete the setup & configuration of the Citrix ITSM connector with your organisations ServiceNow SysAdmin by installing the connector from the ServiceNow app store – https://store.servicenow.com/sn_appstore_store.do#!/store/application/bb5ca9a2db9bd700677d3437b996190f/. 5. Navigate to the newly provisioned connector in ServiceNow for Citrix select “Home” and complete the simple on-baording process which will take you to Citrix Cloud and you’ll see “IT Service Management Adapter” service available subscribe to it. Next return to ServiceNow. 6. Authenticate to Citrix Cloud from ServiceNow entering the pre-created “Client ID” and “Secret” and once authed its IMPORTANT select the CORRECT “Customer ID” and commit. I’ll publish a more detailed blog post in a follow-up blog article or I may update this blog post so stay tuned folks. This entry was posted in #myCUGC, Citrix, Citrix Cloud, Citrix Technology Advocates, Cloud, CTA, ServiceNow and tagged Citrix Cloud, Citrix IT Service Management Connector, Citrix ITSM Plug-In for ServiceNow, ITSM Adapter, ITSM connector in ServiceNow, ServiceNow on August 20, 2018 by lyndonjonmartin. The following content is a brief and unofficial prerequisites guide to setup, configure and deploy Session Watermark policy feature with the XenApp & XenDesktop Service (April 2018) or XenApp & XenDesktop 7.17 on-premises prior to deploying in a PoC, Pilot or Production environment by the author of this entry. The views, opinions and concepts expressed are those by the author of this entry only and do not necessarily conform to industry descriptions or leading best practises. The views expressed here are my own and do not necessarily reflect the views of Citrix. The latest release of the XenApp & XenDesktop Service powered by Citrix Cloud or if you are performing a private cloud (on-premises) upgrade or net new installation of XenApp & XenDesktop 7.17 has some NEW features (another post brewing) and one that I have been waiting on for quiet sometime now has not finally arrived (WAHOO!) and its VERY VERY simple to configure and aids in improving your security posture (I believe) for delivery of apps & desktops powered by Citrix against e.g IP theft. In the below tweet can you see it? The above is from my initial tests using a Windows Server 2016 VM hosted in Azure Northern Europe region running the 7.17 VDA configured to my Citrite #CitrixCloud XenApp & XenDesktop Service so I did not need to upgrade anything to get this new SHINY cool feature yes I said it SHINY. All I was required to do was deploy a new Windows Server 2016 VM from the Azure marketplace, domain join it, install the VDA and connect it to my Cloud Connector and I was ready in less than 25 minutes from initially deploying the VM from the marketplace. Finally on a personal note for me Citrix SysAdmins enabling the “Session Watermark” feature obviously initally tested in a safe environment e.g UAT with a few users from a couple of departments and then rolling it out into production (as when/how your ready) will be making IT the modern “App & Desktop Security Heroes“. IT can apply and configure these new policies to be the most right vs. relevant for your organisations security needs while not hindering the end-users Rich HD eXperience. You have 8 watermarking policies to apply with the 9th one enabling this security capability or feature set with the following list of quirks, suggested policy configuration and more available at – https://docs.citrix.com/en-us/xenapp-and-xendesktop/current-release/policies/reference/ica-policy-settings/session-watermark-policy-setting.html. Before we get started it is worth mentioning that this feature does add an overhead to the compute on the backend (VDA side) and therefore it is suggested to enable up to two water marking features or items. In my overview of this feature I will wont cover off the cost of implementing this security policy as there are multiple variables to consider e.g HDX Graphics Mode and associated policies to provide the right vs. relevant end-user experience vs. how many watermark items do I apply? I have begun testing so bare with me and I’ll publish my findings either on my personal blog here or on https://www.mycugc.org under the “Expert Insights” area. By default this feature is DISABLED as the default behaviour which I believe is the right approach considering its Citrix’s initial release of this #security feature (in my personal view) and secondly online documentation at eDocs suggested recommendations it to enable NOT more than two watermark text items. Finally * indicates that this policy is DISABLED by default when Session Watermark is enabled. * This is the IP addr of the device connecting to the virtual app & desktop. * Utilises the following format yyyy/mm/dd hh:mm to display the users initial connection time to there virtual app or desktop. ENABLED by default when you enable Session Watermark as a policy and uses the following format USERNAME@DOMAINNAME is most optimise for 20 characters or less otherwise truncation might occur of the users logon username. ENABLED by default using “Multiple e.g displays five watermark labels” when you enable Session Watermark as a policy or you can configure “Single e.g displays a single watermark label in the centre of the session“. TIP switching to SINGLE and sticking to two watermark text items for me in my initial tests is a good starting policy however time will tell as I continue to test out this new feature and its capabilities with different HDX Graphics Modes and associated tweaks. * A unicode maximum of 25 characters is supported if you exceed this limit it will be truncated. ENABLED by default set to “17 out of 100” when you enable Session Watermark as a policy, personally I think setting it to just 1 is fine in my initial tests as you want it to be not so in your face to the end-users to be bluntly honest. This entry was posted in #CitrixPartnerLove, #myCUGC, Citrix, Citrix Cloud, Citrix Receiver, Citrix Technology Advocates, Cloud, Community Champions, CTA, Digital Workplace, Digital Workspaces, HDX, HDX Broadcast, HTML5 Receiver, NetScaler Gateway, NetScaler Gateway Service, NetScaler Unified Gateway, PoC, Remote Access, XenApp, XenApp and XenDesktop Service, XenDesktop and tagged Citrix Cloud, Citrix Security, EUC Security, HDX, Security, Session Watermarking, XenApp & XenDesktop Service, XenApp 7.17, XenDesktop 7.17 on April 3, 2018 by lyndonjonmartin. You can download the image at https://lnkd.in/dN74-97 to print. This entry was posted in #CitrixPartnerLove, Azure, Azure AD, Citrix, Citrix Cloud, Cloud, Digital Workspaces, HDX, HDX 3D Pro, Lifecycle Management Service, Microsoft, NetScaler, NetScaler Gateway, NetScaler Gateway Service, NetScaler Unified Gateway, SD-WAN, Secure Browser Service, Security, ShareFile, ShareFile Service, Skype for Business, SmartScale, Workspaces, X1 Mouse, XenApp, XenApp and XenDesktop Service, XenDesktop, XenMobile Service, XenServer and tagged #CitrixPartners, CitrixPartnerLove, Puzzle Challenge on June 30, 2017 by lyndonjonmartin. Its my 5th #CitrixSynergy and this is def one of the best Synergy’s I have ever had the privilege of watching virtually from London, England. Why not in person? I prefer to watch virtually as I am to consume more content faster and translate that into content to update Citrix partners/customers in a timely manner at high level and tech deep dive where required in particular areas or topics. Finally this blog post will most likely change over the next 2-3 weeks as I consume all of the Synergy 2017 content as when/how I can. – 4:45 Citrix User Group Community – https://www.mycugc.org THANK YOU! Join the community today its powered by some of the most passionate Citrix and Technology advocates from around the global! – 11:00 Red Bull Racing I’m not going to say anything you need to watch it! – 29:00 *Workspace IoT (SmartSpaces) demonstration with a users own mobile phone enables an auto login to a Win 10 VD at guest location including welcoming the user based upon his/her smart phone used as there identity. Security people feel free or you will be going nuts right now! – 42:35 Protect against Zero day attacks with XenServer and BitDefender which is available but is something which Citrix announced on 21/06/2016 yes thats right 2016 entitled “A Revolutionary Approach to Advanced Malware Protection” – https://www.citrix.com/blogs/2016/06/21/a-revolutionary-approach-to-advanced-malware-protection/ 21/06/2016 yes 2016! – 47:00 Brad Anderson Corporate Vice President of the Enterprise Client & Mobility @Microsoft discusses shortly and then prefers to demonstrates our joint Citrix + Microsoft “Better Together” capabilities in Mobility, Virtualisation delivery from Azure and more. – 1:01:38 Digital Jungle discussion its def worth your time if you about security and managing the experiences of your users workspace! The following are my current top sessions to watch in no particular order that I believe you’ll gain a lot of value out of watching BUT note that this may change as I continue to consume more of the on-demand content from Synergy 2017. Awaiting for the on-demand video publication but for now I will leave you with the following Tweet as a thought or rather a reminder to make sure that you watch it if you missed it! This entry was posted in #CitrixPartnerLove, ADC, App Firewall, Application Delivery Controller, Azure, Citrix, Citrix Cloud, Citrix Receiver, Cloud, Data Centre, Digital Workplace, Digital Workspaces, GRID, HDX, HTML5 Receiver, Hybrid Cloud, IaaS, Microsoft, NetScaler, nVidia, Public Cloud, Remote Access, SD-WAN, Security, ShareFile, Skype for Business, Skype4B, StoreFront, UEM, VDI, Windows 10, Windows Server 2016, Workspace Environment Manager, Workspaces, XenApp, XenDesktop, XenMobile, XenServer and tagged #CitrixSynergy, #CTA, #CTP, Adaptive Workspace, blog.infrashare.net, Citrix Cloud, Citrix Secure Digital Workspace, Citrix Synergy TV, Citrix Workspace, Gen. Colin Powell, NetScaler, Secure Workspaces, Synergy 2017, Unidesk, Workspace IoT, Workspace Services on May 27, 2017 by lyndonjonmartin. The following content is a brief and unofficial prerequisites guide to setup, configure and test delivering virtual apps and desktops powered by XenApp & XenDesktop 7.13 prior to deploying in a PoC, Pilot or Production environment by the author of this entry. The views, opinions and concepts expressed are those by the author of this entry only and do not necessarily conform to industry descriptions or best practises. The views expressed here are my own and do not necessarily reflect the views of Citrix. A full and complete list of what’s new is avaiable at – http://docs.citrix.com/en-us/xenapp-and-xendesktop/7-13/whats-new.html. I’ll start with one of my Citrix passions which is any and everything surrounding HDX technologies. – *In Studio create a machine catalogue, delivery group or use an existing one with your VDA upgraded from e.g 7.12 to 7.13 and then create a new HDX policy e.g HDX-TestofEDT and select the following HDX policy entitled “” and choose “Preferred“. 2. AMD Multiuser GPU (MxGPU e.g GPU Virtualization works with vSphere only) on the AMD FirePro S-series server cards for HDX 3D Pro workloads only e.g Desktop OSes ref – http://docs.citrix.com/en-us/xenapp-and-xendesktop/7-13/hdx/gpu-acceleration-desktop.html+ with support for up to 6 monitors, custom blanking & resolution, high frame rate and only GPU Pass-through is supported on the following hypervisors XenServer and Hyper-V. For further details please ref to the AMD website at – http://www.amd.com/en-us/solutions/professional/virtualization. – Importing of NUG configurations (ZIP file or via PowerShell) into StoreFront to setup through the XAD Wizard using the latest NetScaler UG 11.1.51.21+ ref – http://docs.citrix.com/en-us/storefront/3-9/integrate-with-netscaler-and-netscaler-gateway/import-netscaler-gateway.html to reduce and avoid misconfigurations. 5. 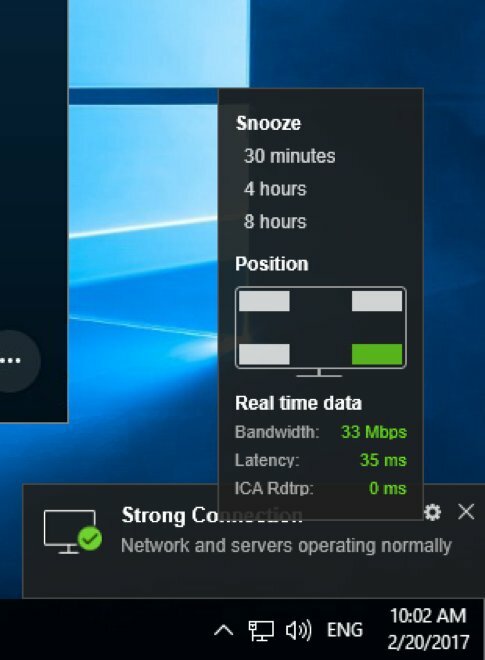 The Connection Quality Indicator is not part of the XAD 7.13 release but an invaluable Citrix tool for Citrix SysAdmins check out its capabilities at – https://www.citrix.com/blogs/2017/02/22/citrix-connection-is-slow-not-really/ and you can download it from – https://support.citrix.com/article/CTX220774 and it also inclues group policies for better SysAdmin controls to enable or disable the tool which is supported from XAD 7.6 LTSR and upwards ref the CTX220774 article. The below image is taken from a Window 10 virtual desktop powered by XenDesktop 7.x. 6. Linux Seamless published applications from a Linux supported OS using the 7.13 VDA – http://docs.citrix.com/en-us/linux-virtual-delivery-agent/7-13/whats-new.html and also please read the publishing apps for Linux at – http://docs.citrix.com/en-us/linux-virtual-delivery-agent/1-4/suse/configuring/publish-apps.html for advanced tips and guidance on seamless mode vs. window manger configuration. 7. LHC in 7.13 introduces a new support feature for brokering operations for Citrix Cloud when the internet connection between the Citrix Cloud Connector and the Citrix Cloud control plane at – https://citrix.cloud.com/ is in a failed state or unavailable due to an ISP outage. You can also force an outage following the documentation available at – http://docs.citrix.com/en-us/xenapp-and-xendesktop/7-13/manage-deployment/local-host-cache.html++ by creating and manually modifying the following registry entry “HKLM\Software\Citrix\DesktopServer\LHC with entry of OutageModeForced” set to the value in the documentation++ to force an outage for testing and or evaluation purposes prior to implmenting Local Host Cache. I’ve embedded below a simple architectural recap of LHC introdcued in XAD 7.12 and you can read in more depth detail about Local Host Cache from a previous blog post available at – http://axendatacentre.com/blog/2016/12/13/whats-new-in-xenapp-xendesktop-7-12/. Finally LHC still provides support for brokering operations for traditional XAD Controller Site Database on-prem ref ++. I’d also recommend that you watch this TechTalks To Go covering LHC in XAD 7.12 release. 8. Provisioning Services 7.13 now supports Linux streaming and a brand new caching technique only available and supported on XenServer 7.1 called PVS-Accelerator. Check the following YouTube video from Citrix entitled “Introducing PVS-Accelerator, only available with XenServer!” via https://twitter.com/juancitrix/status/835202277317148672. 9. HDX Thinwire enhancements in 7.13 have resulted in up to 60% bandwidth savings. Take a look at the following CTX blog post at – https://www.citrix.com/blogs/2017/01/11/hdx-next-cuts-bandwidth-by-up-to-60-yes-sixty-percent/ which has some great high level LoginVSI 4.1.6 graphics comparing Thinwire in 7.12 vs. 7.13 on Windows Server 2012 R2 and 2016. 10. AppDNA what’s new ref – http://docs.citrix.com/en-us/dna/7-13/whats-new.html now includes support for Windows 10 Anniversary Update (AU) and now defaultor analysis and reporting, Secure Web reports and finally improved importing to process to analysis OSes and apps. There are a few more to be sure to check out the whats news! 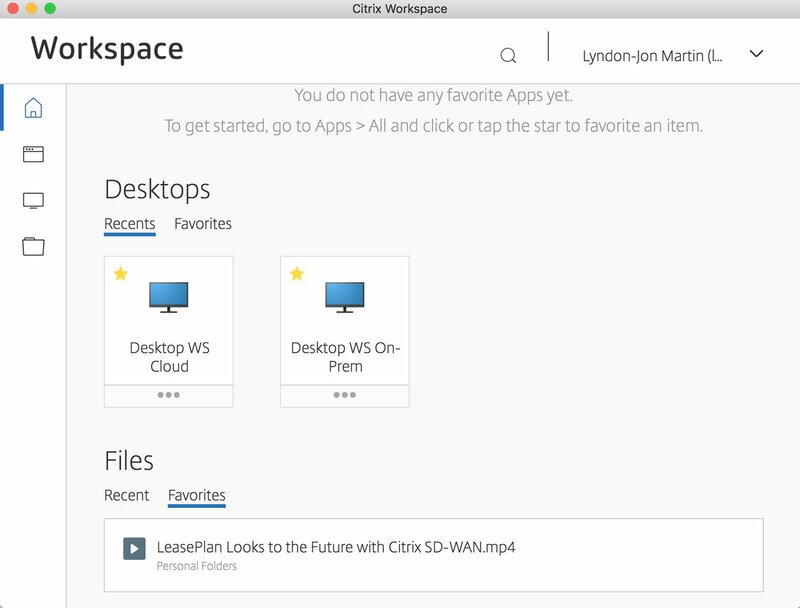 The fastest way to deploy and test the latest new features from Citrix XA 7.13 release with little to no effort is to deploy the “Citrix XenApp 7.13 Trial” from Microsoft Azure available and accessiable at – https://azuremarketplace.microsoft.com/en-us/marketplace/apps/citrix.citrix-xa?tab=Overview. Viso Stencils from Citrix’s Ask the Architect – https://twitter.com/djfeller for XenApp and XenDesktop 7.13. This entry was posted in #CitrixPartnerLove, Citrix, Citrix Cloud, Citrix Receiver, Cloud, Framehawk, HDX, HDX 3D Pro, HDX Broadcast, HTML5 Receiver, Hybrid Cloud, ICA Proxy, Intel, Iris Pro Graphics, Lync, NetScaler, NetScaler Unified Gateway, NetScaler VPX, Private Cloud, Public Cloud, Remote Access, Skype, Skype for Business, Skype4B, StoreFront, VDI, vGPU, Workspace Environment Manager, XenApp, XenDesktop, XenServer and tagged Adaptive Transport, AppDNA 7.13, Azure, Citrix XenApp 7.13 Trial, Connection Quality Indicator, EDT, HDX, HDX EDT, HDX.next, Intel GVT-g, Intel Iris Pro, LHC, Local Host Cache, Removed features XenApp XenDesktop 7.13, SAML, StoreFront 3.9, VDA 7.13, Viso Stencils XenApp XenDesktop 7.13, Windows 10 Anniversary Update (AU), XenApp 7.13, XenDesktop 7.13 on February 25, 2017 by lyndonjonmartin. The following content is a brief and unofficial prerequisites guide to better understand Citrix Cloud, Connector technology and the overall architecture required to setup, configure and test delivering virtual apps and desktops powered by XenApp & XenDesktop Service prior to deploying in a PoC, Pilot or Production environment by the author of this entry. The views, opinions and concepts expressed are those by the author of this entry only and do not necessarily conform to industry descriptions or best practises. The views expressed here are my own and do not necessarily reflect the views of Citrix. Firstly i’d like to provide my definition of public, private vs. hybrid cloud and in my personal view things like SaaS, PaaS have naturally been spin out or off from IaaS e.g Public Cloud. Private Cloud is where you the organisation owns there own OS, Application or Service licenses as well as the physical hardware that allows you to create your own VM instances within your virtual datacentre. In this scenario the h/w is could (a) be purely Colocatied (Colocation) at ISP with or without managed services over and above the Colocation and example providers could include Rackspace, Qubems, Peer1 or (b) your h/w is hosted within your own custom and purpose built data centres facility or comms room dependant upon the organisations size and IT/Technology requirements. Hybrid Cloud is when public and private clouds are connected securely over a IPSec R/A, L2L or SSL VPN connection. Citrix Cloud is an evergreen, managed control plane from Citrix that provides the traditional Citrix management technologies to delivery e.g Virtual Apps & Desktops as Services thereby reducing overhaul management updates & upgrades. This means that Citrix is responsible for the availability of your Citrix management infrastructure in there Control Plane including ensuring that it is on the latest up to day and production version of e.g XAD to deliver DaaS and or virtual apps. Citrix customers and partners are responsible for what is known as a resource location which is where your apps, network and data resides and can exist in a public, private or hybrid cloud deployment scenario and each resource location is securely connected to the control plane using the Citrix Cloud Connector which initiates an outbound HTTPS connection so your completely in control of your apps, network & data within your resource location(s) at all times. If I have not technically explained what is and how Citrix Cloud works successfully then please feel free to watch the below embedded YouTUBE video. The following is my own technical spin/view of each of the Citrix services you can review the Citrix official view of each service at – https://www.citrix.com/products/citrix-cloud/services.html. 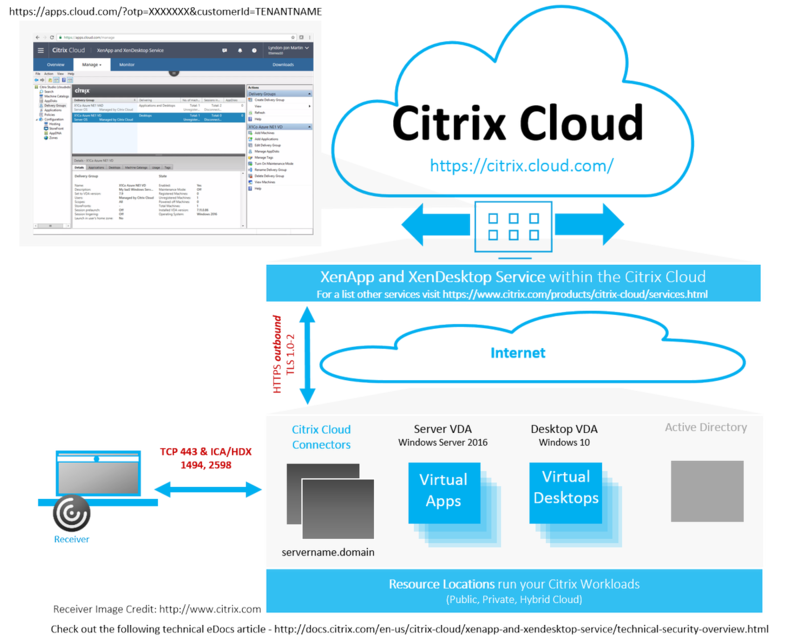 XenApp and XenDesktop Service – HDX virtual app & desktop delivery from any supported resource location running server/workstation VDA(s) while all the XenApp/XenDesktop mgmt infrastructure (Studio/Director) resides in your tenant/account at https://citrix.cloud.com. XenMobile Service – Deploy Secure Apps (MAM), MDM to control your organisation devices with no need to deploy the XenMobile v/a even at your resource location all you need is either an IPSeC VPN tunnel or the Connector to enumerate users in AD to be assigned to delivery groups. ShareFile Service – Follow-me data now controlled within one WebUI. NetScaler Gateway Service – Provides a simple and easy deployment method to gain external remote access to virtual apps & desktops from your resource location(s) via the Citrix Cloud Connector. Smart Tools Service previously Lifecycle Management – Design, build, automate, auto check & update your resource locations with Citrix validated blue prints. 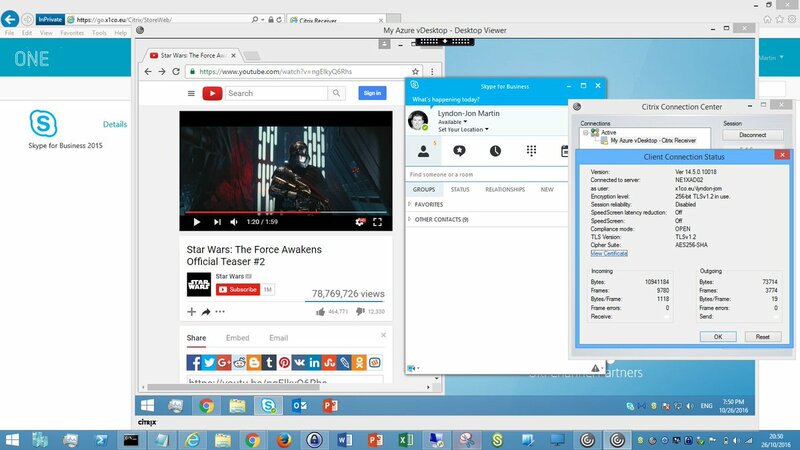 Secure Browser Service – Provides a secure remote virtual browser(s) to access web (internal vs. external), SaaS apps from the Citrix Cloud with zero configuration, with only a link to access your published web apps via the HTML5 Receiver. The following diagram depicts the H/A deployment of Citrix Cloud Connector for use with the XenApp and XenDesktop Service from Citrix Cloud. Please note that this is a simple architectural diagram that does not include a NetScaler in resource location so the assumption is that you users will connect to their virtual apps and desktops either from within the actual Resource Location or via the NetScaler Gateway service hosted and managed by Citrix Cloud. My personal preference is to leverage a NetScaler physical or virtual appliance within your resource location as the benefits of a NetScaler far exceed and go above and beyond that of a simple ICA Proxy gateway for XenApp/XenDesktop. Perhaps a follow-up blog article why I presume NetScaler in the resource location from my personal view point only or I may decide to update this blog article. To better understand how to best secure or harden your Cirix Cloud implmentation and its services please refer to – http://docs.citrix.com/en-us/citrix-cloud/overview/get-started/secure-deployment-guide-for-the-citrix-cloud-platform.html for leading best practises, process & procedures and configuration requirements. The following is deep dive overview of Citrix Cloud connector technology for all the services with the exception of the Smart Tools service which leverages its own connector which is used to check your Citrix workloads, scale up/down and or even build or tear down workloads in resource location(s) via blueprints. You must download and only install the Citrix Cloud Connector for your resource location from “Identity and Access Management” that matched your domain forest, don’t mix and match these! The installation is fairly straight forward and simple as descriobed and outlined at http://docs.citrix.com/en-us/citrix-cloud/citrix-cloud-connector/installation.html, once the installation completes wait for the connectvity test to pop-up and complete successfully prior to navigating back to Citrix Cloud to validate that the Connector has scuessfully registered with Citrix Cloud+. You can also perform automated installation leveraging the following command line arguments when installing the Connector “CWCConnector.exe” /q /Customer:Customer /ClientId:ClientId /ClientSecret:ClientSecret /ResourceLocationId:ResourceLocationId /AcceptTermsOfService:true. Although the Connector communicates outbound on HTTPS 443 it make also require one or more of the following ports outbound only as described at – http://docs.citrix.com/en-us/citrix-cloud/overview/get-started/secure-deployment-guide-for-the-citrix-cloud-platform.html for one or more of the Citrix Cloud Services so please consultant the documenation for each Service carefuly for high security enviroments to ensure that the organisations firewall ACL’s for the PoC are correctly configured. You can install hypervisor tools, anti-virus software (Tested as of 26/10/2016++ McAfee VirusScan Enterprise + AntiSpyware Enterprise 8.8) on your VM instances that have the Citrix Cloud Connector technology installed however it is not recommended to install any other software or unnecessary system services nor should you allow any domain users access unless they are a Domain or System administrator of the Citrix environment. In summary treat these Connectors as you would your XAD Controller(Broker). The installation logs are available at “%LOCALAPPDATA%\Temp\CitrixLogs\CloudServicesSetup” and post the installation its consolidated to the following location “%ProgramData%\Citrix\WorkspaceCloud\InstallLogs“. 1. http://status.cloud.com/ is your friend and will provide you with vital up to date information about the Citrix Cloud platform (control plane or SaaS tier) and each of its Services e.g XenApp and XenDesktop Service or Smart Tools. 3. The leading best practises is for the Citrix Cloud Connectors to not be offline longer than two weeks as the connectors are regularly updated from Citrix Cloud with the latest updates (Evergreen) which is why each resource location requires at a bare min 2x or a pair of Connectors. The Citrix Cloud Connector firstly should always be implemented in pairs at a minimum within any resource location and installed onto either Windows Server 2012 R2 or 2016 AD joined VM instances. The connectors are stateless and brokering requests are load-balanced via Citrix Cloud to the connectors within your resource location(s) and if a connector does not respond the queued tasks are redistributed to the remaining connector(s). As the connectors are stateless this also means that they do store any mgmt configuration for Citrix Workloads at the resource location as this is held within the Citrix Cloud by the Service that you are utilising e.g XenApp and XenDesktop Service. +If you setup a PoC with a single Connector it will probably display as amber for a period of time prior to turning green as you have only configured 1x Connector for your resource location. You can check your Connector status for your resource locations by navigating from https://citrix.cloud.com/ to https://citrix.cloud.com/identity and under “Domains” select your domain forest(s) and expand it and you can review your Connectors name e.g servername.dommain e.g connector1.x1co.eu and its status (red, amber or green). The leading best practise for h/a at your resource location is for your Citrix Cloud Connectors to be implemented as N+1 for redundancy – – https://en.wikipedia.org/wiki/N%2B1_redundancy. The Connector logs are stored at “C:\ProgramData\Citrix\WorkspaceCloud\Logs or use %ProgramData%\Citrix\WorkspaceCloud\Logs” for verifying ongoing communication and helping with troubleshooting. Once the log(s) size exceeds a certain threshold its deleted BUT Administrators are able to control the log retention size by adjusting the following entry in the Windows registry “HKEY_LOCAL_MACHINE\SOFTWARE\Citrix\CloudServices\AgentAdministration\MaximumLogSpaceMegabytes” to meet your organisations logging/auditing requirements. The core four primary functions/roles of the Connector are Authentication, Proxy, Provisioning and Identity which are powered by the following Citrix Cloud services listed below (as of Jan 2017). You can view a detailed architecture technical diagram of the Connector under the XenApp and XenDesktop Service online documentation at – http://docs.citrix.com/en-us/citrix-cloud/xenapp-and-xendesktop-service/technical-security-overview.html. I have writen a fairly detailed blog article describing how-to deploy the XenApp and XenDesktop Service here. This entry was posted in Apps & Desktop Service, Citrix, Citrix Cloud, Citrix Workspace Cloud, Cloud, CWC Connector, Hybrid Cloud, IaaS, Infrastructure, Lifecycle Management Service, NetScaler Gateway Service, Private Cloud, Public Cloud, Secure Browser Service, ShareFile Service, SmartScale, XenApp and XenDesktop Service, XenMobile Service and tagged Citrix Cloud, CWCConnector.exe, Deploying a Citrix Cloud - XenApp and XenDesktop Service PoC, HTTPS, https://*.xendesktop.net, https://citrix.cloud.com, N+1, NetScaler Gateway Service, ShareFile Service, XenApp and XenDesktop Service, XenApp Essentials Service, XenDesktop Essentials Service, XenMobile Service on January 27, 2017 by lyndonjonmartin. The following content is a brief and unofficial overview of how-to front your virtual apps & desktops powered by XenApp 7.11 with NetScaler 11.x.n using Microsoft Azure (ARM). The views, opinions and concepts expressed are those by the author of this entry only and do not necessarily conform to industry descriptions, best practises. The views expressed here are my own and do not necessarily reflect the views of Citrix. I’ve had a lot of cloud 1st strategy conversations with IT Pro’s, Citrix SysAdmins & organisations alike recently so I thought everyone whom is searching for how-to front XenApp with an Azure NetScaler could benefit from this blog post :-). This blog post covers a how-to even with NetScaler in single IP mode to achieving https://FQDN (Image 2) for the gateway vs. https://FQDN:8443 (Image 1) when deploying NetScaler in Azure (ARM). 2. I presume that you have setup a your network, IAM if not refer to https://azure.microsoft.com/en-gb/get-started/ for getting started how-to from Microsoft. 3. Click on + New in the top left of the ARM web ui and type in NetScaler and select NetScaler VPX Bring Your Own License or for a quick review check out – https://azure.microsoft.com/en-gb/marketplace/partners/citrix/netscalervpx110-6531/. 5. Enter in a username and choose auth to be either SSH public key or Password I choose password to access the NS Admin WebUI for simplicity of all readers of this blog. 6. Select your chosen of default Subscription if you have more than one and then select your existing Resource Group where you XenApp 7.11+ environment and XenApp 7.11+ VDA Workers and your mgmt. VM running AD/DNS server resides. Remember I am keeping this simple as it’s intended for PoC’s only! 7. Continue to select your chosen Azure instance for NetScaler I choose DS2_V2 Standard which consists of 2 Cores, 7GB of RAM. 8. Select your storage account, virtual network & subnet e.t.c and high availability set then click Select to continue. 9. Review your purchase of NetScaler and then click Ok to purchase and Azure will begin building your NetScaler VPX in your Azure chosen subscription which will take no more typically than 10 minutes. Firstly be aware that when deploying a NetScaler instance on Azure for virtual apps & desktops you’ll be setting up NetScaler to run in single IP mode (YES!) which means that you’re connecting to internal TRU resources on the NetScalers IP addr (NSIP) but you connect using different ports e.g ICA Proxy on 8443 so lets begin with the setup. 1. Login into your NetScaler using the NS Admin Web UI do not provide a SubnetIP Addr (SNIP) just select Do It Later and proceed with the initial setup as per normal. 4. Next select the following model “VPX” select variation e.g “Platinum 1000” select duration e.g “90 Days”. 5. Complete the onscreen process note that you will require a .Citrix.com account or you need to create an account. 6. Once you receive an e-mail with your key/code head over to at https://www.citrix.com/account/toolbox/manage-licenses/allocate.html or goto and select find and allocate your licenses or look for the licensing button (link) and select it. 7. If your key/code it not visible select “Don’t see your product?” in text in/around the top right-hand side. A pop-up appears now enter in the code provided on e-mail from the Citrix Eval Store e.g “CTX34-XXXXX-XXXXX-XXXXX-XXXXX” and continue. 8. You will need to enter in the Host Id of your NetScaler it can be found once logged in using the NS Admin Web UI “NetScaler -> System -> System Information” then look under the heading “Hardware Information” and you find “Host Id” copy and paste it into the required field and then download the license file. 9. In the NS Admin Web UI click the cog icon top right then select licensing and upload the license and select to reboot the NS to apply the license. Now that you have setup NetScaler within your Azure subscription in your chosen region you’re ready to begin setting up NetScaler to front virtual apps & desktops (Server OS 2012 R2 or 2016) powered by XenApp 7.11+. 2. Select the XenApp/XenDesktop wizard and review the prerequisites carefully prior to continuing BUT in summary you’ll need an SSL Cert, LDAP service account + details, XenApp 7.11+ environment with StoreFront. 3. Enter in the static IP addr assigned by Azure or OTHER METHOD of your NetScaler VPX YES that’s right! 7. Setup external DNS entries e.g go.x1co.eu to point to your NetScalers static IP addr found in the Azure ARM Web UI and once you have verified it is functioning correctly using a shell (IPCONFIG /FLUSH after settin-up the DNS entries waiting 10-15 min depednant upon your ISP) the open up an internet browser and type in e.g https://go.x1co.eu:8443 and dont forget the :8443 at the end of the FQDN. 8. Attempt to login either using sAMAccountName e.g username or userPrincipalname e.g username@x1co.eu and then you should be able to successfully login and launch your virtual apps & desktop as per the below image. 1. If you are choosing this option as your preferred lets hope then complete steps 1-5 and also step 7 to save you time! 2. IMPORTANT STEP: Setup StoreFront to allow remote access however the configured default gateway MUST BE e.g https://go.x1co.eu NOTICE NO :8433 YES not :8443 here. Now on the call-back FQDN addresses YOU MUST include 8443 e.g https://go.x1co.eu:8443 instead of just https://go.x1co.eu otherwise fronting NS with an Azure L/B to acheive HTTPS://FQDN for the XAD Gateway (ICA Proxy) will NOT WORK!!!! 3. Now switch to the Azure ARM Web UI. You should probably read the following useful resources – https://azure.microsoft.com/en-gb/documentation/articles/load-balancer-overview/ and for PowerShell creation check out – https://azure.microsoft.com/en-gb/documentation/articles/load-balancer-get-started-internet-arm-ps/ for any Citrix consultants out there. 6. Enter in a name and choose your assignment choice “Dynamic” vs. “Static” and click OK.
12: Now navigate to https://FQDN and attempt to login either using either sAMAccountName e.g username or userPrincipalname e.g username@x1co.eu and thereafter you should be able to successfully launch your virtual apps & desktop published by XenApp 7.11+. The below image represents the end goal when fronting an Azure NetScaler in Single IP Mode with an Azure Load-Balancer as per the below image. The following how-to’s are from a 2016 Citrix Technology Advocates (CTA) – https://www.citrix.com/blogs/2016/05/23/expanding-recognition-for-community-contributors-citrix-technology-advocates/ Dave Bretty – http://bretty.me.uk/ which covers off how-to setup and configure FAS, NetScaler SAML/ADFS Proxy, Azure MFA and much more, so follow the links in order listed below. This entry was posted in Azure, Citrix, Citrix Receiver, Cloud, CVPN, Data Centre, Digital Workspaces, HDX, HTML5 Receiver, HTTPS, Hybrid Cloud, IaaS, ICA Proxy, Mobile Workspaces, NetScaler, NetScaler Gateway, NetScaler Unified Gateway, NetScaler VPX, PoC, Private Cloud, Public Cloud, Remote Access, SD-WAN, Software-defined Workspace, XenApp, XenDesktop and tagged 8443, ARM, Azure, Azure NetScaler, Azure Resource Manager, Deploy a NetScaler in Azure, Deploying Azure NetScaler Gateway to front XenApp, deploying netscaler in azure for xenapp, deploying netscaler in azure for xendesktop, IaaS, ICA Proxy, NetScaler, NetScaler Azure Instance, NetScaler Azure Single IP Mode, NetScaler Gateway, NetScaler in Azure, NetScaler Unified Gateway, NetScaler VPX in Azure Deployment Guide, Setup Azure NetScaler Gateway for XenApp, Setup NetScaler 10.5 in Azure, Setup NetScaler 11 in Azure, Unified Gateway on October 29, 2016 by lyndonjonmartin.